Flowers, herbs and other plants can be grown in any number of containers, from round plastic ones to wheelbarrows. A wheelbarrow garden adds and interesting touch to the front yard. Planting a garden in a wheelbarrow is a fairly simple project that does not take a lot of time. When reusing items, it will not cost much to accomplish this project. It does not matter what type of wheelbarrow you use. It can be an old metal one with rusted areas and small holes, which will provide needed drainage for the garden. You can use a wooden wheelbarrow with no tire. 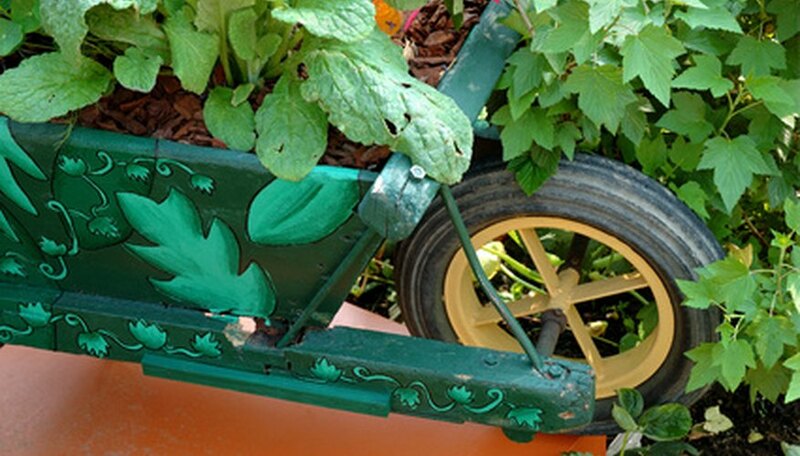 You can also build one a wheelbarrow, so that it looks new, even if you are using recycled materials. Or, you can use new materials or buy a wheelbarrow-style planter. Determine where you will place the wheelbarrow ahead of time, especially if it is full size, as it may be too heavy to move once the soil is added. A wheelbarrow planter works on the front lawn, opposite a raised garden bed. If you spread mulch underneath it, you won't have to mow underneath it. You can also place it near an old well house for a vintage look. Use of an organic potting soil will work well for this project, when mixed in a 1:1 ratio with an organic compost. The compost and soil can be placed in the wheelbarrow together and mixed with a spade or with bare hands. It should fill the wheelbarrow almost to the top, and be evened out before planting. Water can be added at this point to just moisten the soil. You can grow many plants in a wheelbarrow. For example, a variety of sunflowers, including ballad sunflowers that grow 2 feet tall. Firecracker sunflowers are another option, and will grow up to 3 feet tall. Grow a salad garden in a wheelbarrow, or try a couple of tomato plants. Cherry and grape tomatoes are excellent choices as the plants tend to be smaller. Cucumbers would make a great addition, as would peas. The vining variety of peas can be trained to trail down the side of the wheelbarrow, and over the handles. Place salad greens, such as cabbage, spinach and Romaine lettuce around the other plants. There should not be an issue with weeds when using this type of planter. The most important thing to remember is to keep the plants watered. The soil should be kept moist, unless seed packets dictate otherwise. Do not let vines get away from the planter--trim them back if necessary.